Just fair warning here: This posting has nothing to do with selling and may contain material that might seem offensive to some bloggers. For those of you who follow this blog, you've seen several postings in the past regarding science and critical thinking. Here's a timely editorial as we celebrate the end of 2011. I was perusing CNN on my iPhone4S (shameless plug) on Christmas Day (12/25/2011) and noticed an article about Pope Benedict XVI Christmas Mass message. While I'm not Roman Catholic, the Pope is the leader of one of the world's largest organized religions and I thought, "Why not hear what the 84-year old Pontiff has to say." While his message started out innocently enough, he turned in short order to the ". . . commercial celebration of Christmas." "Today Christmas has become a commercial celebration, whose bright lights hide the mystery of God's humility, which in turn calls us to humility and simplicity." If I believed in a super-natural God of the Catholics (which I don't - nor do I believe in Zeus, Mohamed, Brahma, Vishnu or any other God for that matter), I'd probably be concerned over the capitalization of the holiday season too. OK, still willing to read more. "If we want to find the God who appeared as a child, then we must dismount from the high horse of our 'enlightened' reason," he said. "... In this spirit let us celebrate the liturgy of the holy night, let us strip away our fixation on what is material, on what can be measured and grasped." Really? Dismount from the high horse of reason? Isn't "reasoning" the only thing that got us out of the Middle Ages? Isn't "reasoning" the thing that provides electricity for the Pope's bedchambers? Isn't "reasoning" the foundation for advances in medicine, relieving the suffering of millions of people, feeding the hungry? He wants us to move AWAY from reason? The Pope suggests that we "strip away our fixation on what can be measured and grasped?" Just go ahead and stop soft-pedaling here. "Measured and grasped" = Science. It couldn't be more clear. The Pope is clearly delivering the message that we should de-emphasize scientific process and thought. What utter nonsense and what makes this out-right dangerous is the billions of Catholic followers that will hear this message loud and clear. Make no mistake: If the Pontiff found out tomorrow that science discovered some artifact that supported his religious beliefs, the Church would have this published on every newspaper throughout the world. Unfortunately, when it comes to other scientific proof that's "measured and grasped," (for example, that the earth is really 4.6 billion years old) the Church claims that science cannot be used to measure religious faith/belief. This common separation of religion and science is known as Separation of Magisterium and is absurd. Why can't we ask critical questions that only science can answer? Why can't we ask for evidence of a young earth? Why can't we propose a conflicting hypothesis to whether or not God exists? The answer to these questions should be, "We can and should." 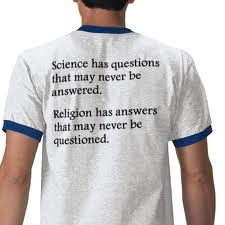 Unfortunately, those shrouded in belief and faith cannot answer any of these questions with anything other than, "religion/faith/belief is sacred." As you go to sleep tonight, in your heated/air-conditioned home, and after a nice meal at your favorite restaurant, ask yourself what really impacts the way we live. What would life be like if the Crusades or Holocaust never ended? What would life be like without organized religion? John Lennon asked the question: "Imagine there's no heaven...and no religion too." He was assassinated for it. So were the thousands who died in 9/11. Terrorists? Of course, religious terrorists, all willing to go to a promised after-life for killing American infidels. This holiday season is a time for reason, for understanding, for science, and for raising our consciousness.